What are “Jewish” Genetic Disorders? This term describes a group of conditions which are unusually common among Jews of Ashkenazi, Central, and Eastern European descent. Although these diseases can affect Sephardi Jews, non-Jews, and those from mixed backgrounds they appear in those of Ashkenazi Jewish descent more often—as much as 20 to 100 times more frequently. Why Are Certain Disorders More Common Among Ashkenazi Jews? Scientists believe that certain disorders became more common among Ashkenazi Jews because of at least two processes: the “founder effect” and genetic drift. 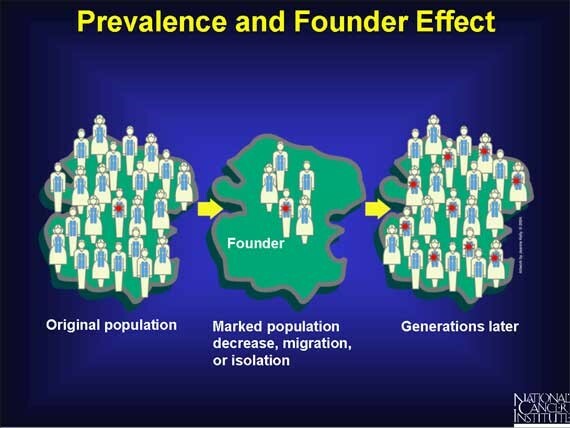 Certain disorders tend to be more common among Jews due the "founder effect". It is believed that most of today’s Ashkenazi Jews descended from a group of perhaps only a few thousand individuals or “founders” that immigrated to Eastern Europe during the Diaspora. Today millions of people are able to trace their ancestry directly to these “founders”. Thus, even if just a few of these individuals or founders had a mutation, those gene mutations would become more frequent over time. Genetic drift refers to the increase in frequency of the genes for these disorders in this group, as a result of chance. Since Jews historically tended to marry within their faith and community, the relatively high frequency of these genes among Jews did not pass into other communities, nor was the frequency lessened by the introduction of other genes from outside the Ashkenazi population. Are There Sephardi Jewish Genetic Diseases? Yes, but Sephardi diseases typically differ based on country of origin. In the following sections detailing Jewish genetic disorders, you will find more information on a few commonly linked Sephardic genetic disorders, but Sephardic Jews are recommended to seek advice from a genetic counselor to determine the most appropriate screening given what they know of their family history.